Today, Calvin did something that he’s never done before: he walked the equivalent of about two blocks in our neighborhood, exhibiting only the very slightest stubbornness as we began. 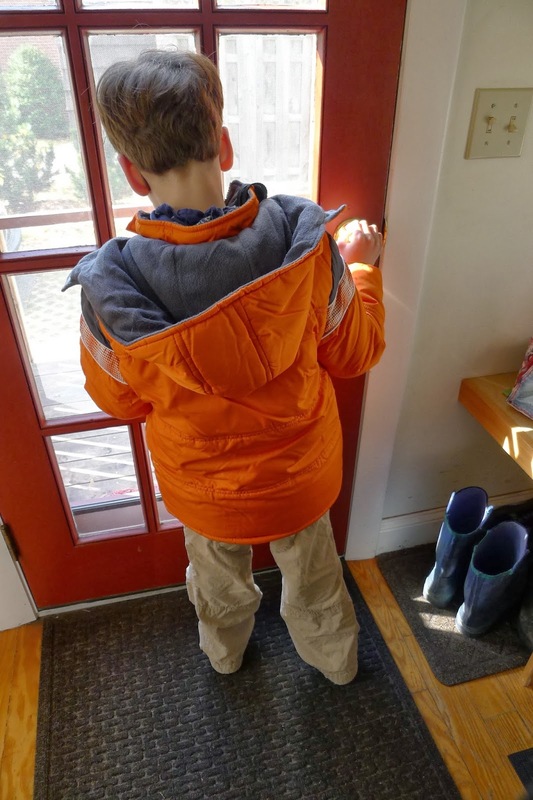 In his new puffy winter jacket, which nearly matched some of the leaves still dangling from the trees, we set off down the sidewalk, his hand in mine. The late morning sun beat down pleasantly upon us, its angle not enough of a distraction to impede Calvin’s progress. At Woody’s we stopped and I helped Calvin ring his bell. I wonder if I can take Calvin trick-or-treating this year? I thought, as we waited for Woody to appear. But Woody wasn’t home, so I decided to see if Calvin would walk a little further. Calvin pigeon-toeing, we walked past Mike’s house to the corner, then crossed with a group of college students and their parents heading toward a weekend event at the fields. Once on the other side we turned to head back, stomping on acorns and drifts of pine needles blanketing the asphalt path. “You’re doing so great!” I exclaimed, as we trudged slowly past Jill’s wilting phlox and tangled tomatoes, then by the Ferdinand’s hydrangea with its sagging blush puffs just low enough for Calvin to bop with his free hand. From there it seemed Calvin recognized our house, so we crossed back over and he let go of my hand the rest of the way to the car as I held on tightly to his harness. “Mama’s so proud of you,” I told him, giving him hugs and kisses next to a glad smile. For a moment, walking hand-in-hand down the street with a willing child, I felt almost normal, felt almost free.